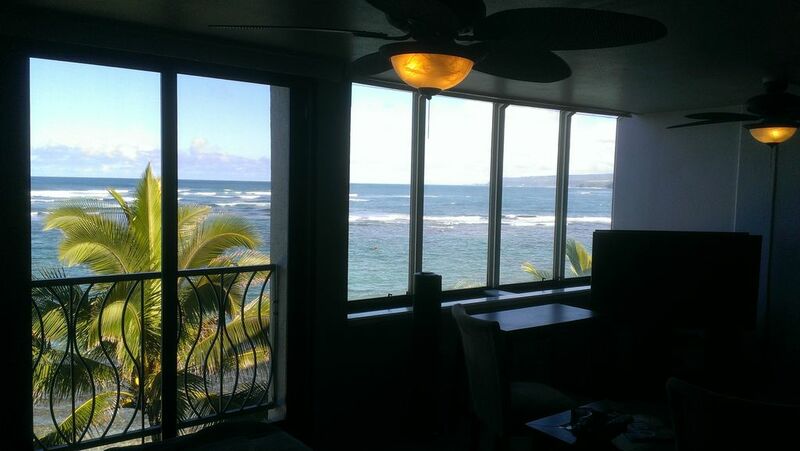 Ce condo entièrement équipé, face à l'océan, est situé à Waialua sur la magnifique côte nord d'Oahu. La chambre principale à flanc de montagne dispose d'un lit queen, oreiller de mousse de confort lit supérieur, salle de bain complète en suite et TV écran plat. La chambre côté de l'océan, qui peut être fermé à partir de la salle de séjour par des panneaux coulissants Shoji de la vie privée, dispose d'un lit queen Murphy confort de la taille de mousse pour le sommeil d'une bonne nuit de repos pour les sons des vagues de l'océan. Il ya aussi un canapé-lit queen dans le salon pour accueillir 2 personnes supplémentaires et une deuxième salle de bain complète. La cuisine et la salle à manger sont entièrement meublées avec mises à jour des appareils en acier inoxydable et tout le nécessaire pour préparer des repas cuisinés à la maison. Une machine à café Keurig est fourni, donc apportez vos tasses K ou choisissez parmi la sélection fourni. Le coin salon dispose d'un canapé-lit, 2 chaises, une table basse, un bureau, Wifi, et un téléviseur à écran plat 55 pouces avec chaînes câblées HD et un lecteur Blu-ray / DVD. Une taille laveuse à haute efficacité et sécheuse sont également disponibles dans l'unité. Le bâtiment dispose d'une grande piscine extérieure et un bain à remous, des grils à gaz en plein air, des chaises longues chaise, meubles de patio pour les repas, et des chaises de plage. Un espace de stationnement de deux voitures, tandem est fourni avec l'appareil (stationnement dans la rue est également disponible). Pour les voyages de plage, il ya des chaises de plage, un parasol, des planches de bodyboard, masques, tubas, palmes, une petite glacière, et serviettes de plage. La ville populaire de Haleiwa se trouve à 5 minutes en voiture et dispose de nombreux restaurants, boutiques, et un port de plaisance. Plus à l'est sur l'autoroute Kamehameha, vous trouverez toutes les célèbres plages de la côte nord, les plages de Waimea et Waimea, le complexe de Turtle Bay, les camions de crevettes Kahuku et le centre culturel polynésien. Il ya deux salles de bain complètes dans l'unité: un maître sur-suite et une deuxième salle de bain complète. Perfect setup for two couples! The views were fantastic! We seen whales from the condo. We saw turtles almost every day. The two bedroom, 2 bath setup worked well for our two week stay in Hawaii. The beds are comfortable, the kitchen, bathrooms and laundry were stocked with what we needed. The quiet location on the North Shore was excellent to get away from the hustle of Honolulu and just a short drive if we wanted to go there. We would definitely stay here again. You won't regret this stay! We absolutely loved staying here! The view is amazing and the condo itself is wonderful. It was stocked with pretty much anything you could think of. The manager was very helpful and responsive. We will definitely be staying here when we come back! All our needs were met, or Deborah was ready to help. It was great to have snorkeling equipment & beach chairs available 24/7, the view was amazing & kitchen well stocked. It got warm inside a few times, despite our efforts to make the best use of the ceiling & standing fans, and cross wind with front door & slider both open, but for the price, even with out AC, we'd stay there again. 1. This one has a roller shade in the living room. The view is amazing; however, it can get quite warm in the summer. Being able to pull down the roller shade to help with blocking some of the sun made a HUGE difference. 2. The curtains in the front bedroom were blackout curtains and therefore, we were able to have more privacy as well as sleep later. 3. There is a front screen door. While this may not seem like an amenity, it certainly is. The last condo we stayed in did not and therefore, it was hard to get a breeze going through the building. 4. Ample fans - I believe there were 3-4 ceiling fans, as well as 5-6 portable fans. Both times we have stayed in this building it was in the middle of July, so it is warm and humid. The amenities I listed above certainly make this condo a better choice. The location was great for us. My husband was there for work and therefore we had two cars. This condo has a tandem parking spot, so we actually had reserved spots for both cars. The only issue we had while there was that the spring in the shower rod broke. We contacted the property manager and it was fixed before we made it back for the day. She was great! My only recommendation would be to maybe have some new bath towels purchased for the condo. The ones in the main bathroom (there are two!) had a slight mildew smell to them. I would highly recommend this condo and will hope to stay here again should work bring us back! We really enjoyed our stay at the condo! It was incredibly close to the beach, which we loved. Its in a quiet neighborhood area, and close to a small cute town! We would highly recommend this condo to anyone looking! This condo was everything it was described to be with one exception. It has absolutely beautiful views of the ocean and you can hear the sound of the strong waves very close. The condo was stocked well with plenty of toys and towels and a cooler - pretty much anything you need for days out at the beach, and everything you need for inside as well. The owner was very responsive to emails, and gave you many wonderful recommendations to help out, and Deborah, the property manager, was very kind and helpful, in spite of having 2 other jobs she is responsible for! The only exception I have to mention is the lack of AC. Supposedly the trade winds keep you cool without AC, but we went in May, and it was very warm, so we never cooled off until after midnight every day, even with 3 fans blowing just in our room. The only reason I remove a star for this is that I believe that in all fairness, it should have been mentioned along with the beautiful description of the condo. Not everyone is familiar with the Hawaiian style of life. I did my research, I talked to many people who have been to Hawaii (& was even told by many that the North Shore was the best area to stay for a quieter vacation, which that part is true! ), & I read more than half of the reviews for this condo specifically, however, due to the timing of when I booked it, the majority of the reviews I read were written in the winter months, so there was no mention of the lack of AC. After I came home I read back through all of them, and saw the later reviews regarding the warm months. This puts a new perspective on it. It's hard to refresh and recuperate for the next day when you are hot and sweaty again immediately after taking a shower. Being from Texas where AC is a given everywhere, it never crossed my mind to ask, so it would have been helpful for the owners to just have mentioned it up front to help people to prepare better. (And just FYI, the majority of places on the North Shore also do not have it.) The only other thing I would mention would be the beds & pillows. For us, the beds were hard & the pillows old & flat. However, my husband has back problems, and I admit that we are very spoiled to an extremely soft bed, so this is a varied opinion to each individual taste and not fair to call a negative, since some people find firmer beds comfortable. I just thought someone might find it nice to know this as well. Overall, the condo was a great choice and an amazing place to stay! I'm sorry you were not comfortable, but yes, our condo building does not have A/C. Many reviews mention this on a lot of properties on the north shore. While many people stay here during the summer and don't seem to mind the warmer days, I do understand that some find it unpleasant. For all potential guests, please use the filters when searching on the site as you can check the "air conditioning" box (among others) to rule out properties that don't fit your tastes and/or needs. Cancellation policy: 100% refund if cancelled 60 days before arrival date, after which a refund will only be provided for any of the same dates that the unit can be rented. Occupancy: Both adults and children count towards the maximum guest count of 6.